Japanese astronomers Using a powerful telescope based in Hawaii, said Wednesday they had found a "protocluster of galaxies" 12.72 billion light-years away from Earth, which they claim is the most distant cluster ever discovered. The team peered back through time to a point just one billion years after the Big Bang, the birth of the universe. The discovery was jointly made by researchers from the state-run Graduate University of Advanced Studies and the National Astronomical Observatory of Japan using the Subaru Telescope in Hawaii. "This shows a galaxy cluster already existed in the early stages of the universe when it was still less than one billion years into its history of 13.7 billion years," the team of astronomers said in a press release. Researchers using NASA's Hubble Space Telescope have previously announced the discovery of a possible cluster of galaxies around 13.1 billion light-years from Earth, which has yet to be confirmed, the Japanese researchers said. Astronomers at the Chandra Space Telescope, one of NASA's four Great Observatories, also recently announced they they discovered one of the most distant clusters of galaxies in the Universe, located at a distance of about 10.2 billion light-years away from our planet (image at top of page). 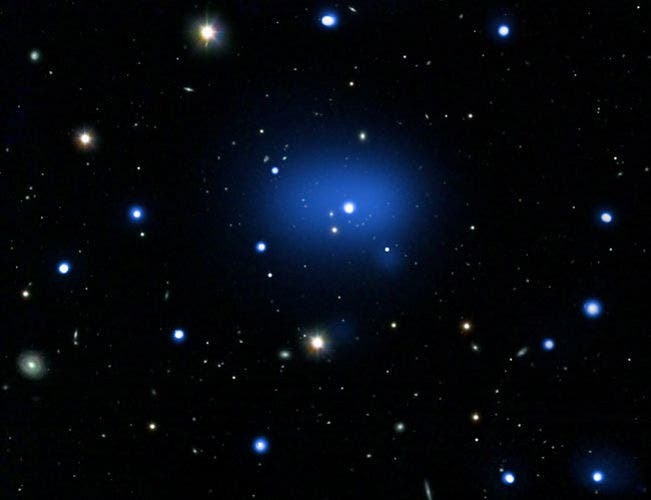 According to the experts, the cluster maintains the same traits in the image of it we see today as it did when the Cosmos was only a quarter of its present age. The XMMXCS J2215.9-1738 cluster was until recently the farthest known such formation. The new Chandra formation exceeds its predecessor's distance by more than a billion light-years. Clusters are the largest manifestation of a gravitationally bound object in the entire Universe. They are made up of numerous galaxies, all held together by the force of their mutual gravitational interactions. The newly found one may provide astronomers with a wealth of knowledge about how the early Cosmos evolved at a crucial stage in its development. The oldest known cluster –dubbed JKCS041–until the Sunaru proto-galaxy discovery, was found at such a great distance, that astronomers believe it may have been one of the first such structures to have ever formed after the Big Bang. The estimates are based on the amount of time that scientists believe would take for all of the galaxies in a cluster to form individually, and then to become gravitationally drawn to each other. “This object is close to the distance limit expected for a galaxy cluster. We don't think gravity can work fast enough to make galaxy clusters much earlier,” Stefano Andreon, a Chandra team member, explains.